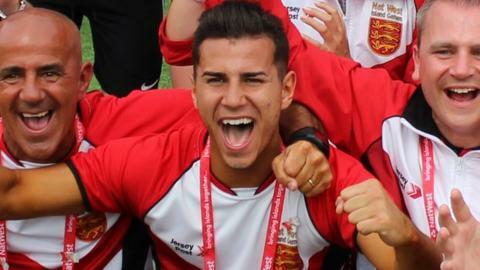 Jersey striker Charlie Petulla scored four goals on his debut as St Peter beat First Tower in the first round of the Charity Cup. The island women's team assistant manager helped his new club to a 5-1 win as James Carolan got the fifth. Aaron Gouveia's hat-trick saw St Brelade beat Sporting Academics 3-0 in boss Keith Le Cornu's first game in charge of the western parish side. St Ouen's tie at St Clement was called off because of a waterlogged pitch. Goals from Dominic Pougelle and Ryan Thorpe had put St Ouen 2-1 up after before a downpour forced a halt to game after 63 minutes. Elsewhere, Grouville's Bradley Russell netted a hat-trick to help them to a 4-0 win over Beeches.